The first cafés were opened in Bratislava in the 18th century. Aristocrats drank European-style coffee and wine in elegant salons. In the 19th century, the middle classes joined – merchants, lawyers, doctors and artists. The culmination of 20th-century café culture came in the inter-war period, when students, writers and artists had their favorite cafés where they could “fight for politics”. This social space disappeared after World War II with the Communist rulers of Czechoslovakia. So coffee was usually drunk only at home. After 1989 and the secession of Slovakia from the Czech Republic in 1993, the Slovaks were able to travel freely, experience the open café culture of Western Europe and to taste exotic coffees from Latin America and Africa. The old cafes were not enough anymore. Accordingly, today you get specialty coffee in cafés and from micro roasters. 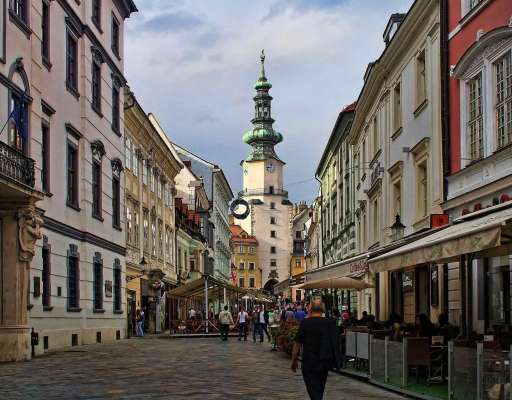 In the capital Bratislava there are around 160 cafés around the Old Town Square. With so much love of coffee, it is not surprising that Slovakia ranks sixth in the ranking of the world’s largest coffee drinkers, right behind Germany. The Slovaks drink 1,201 cups daily. For coffee, there is Medovník, a cake with lots of honey and cinnamon. Typical Slovak strong coffee from the machine, that has nothing to do with espresso. Unlike the original Turkish coffee, 1 tsp coffee powder is simply poured over in a cup or glass with boiling water and sweetened as needed. Before the coffee is drunk, you give it 3-4 min. so that the coffee powder can settle. For some years, Turkish coffee has also been prepared here in a cezve (džezva in Czech).